Sherren White is a board certified Physician Assistant that has been practicing Dermatology since 2003. She graduated from the Honors College at Grand Valley State University with a Bachelor of Science in Biomedical Sciences in 2001. She continued at GVSU to earn her Master’s Degree in Physician Assistant Studies in 2003. She started practice in Lansing in 2003, and was honored to move to Detroit to join Heidelberg Dermatology in October 2015. Sherren is passionate about practicing both medical and cosmetic dermatology. 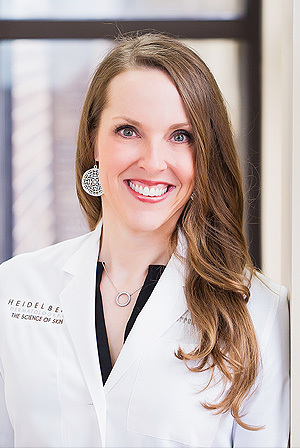 She provides a full range of dermatology services including the treatment of all types of skin conditions, laser surgery, dermatologic surgery, and cosmetic procedures including sclerotherapy for spider veins, Botox injections, hyaluronic acid fillers (Juvederm, Restylane), Kybella, chemical peels, and microneedling. Sherren is an active member of the American Academy of Physician Assistants, Michigan Academy of Physician Assistants, Society of Dermatology Physician Assistants, American Academy of Dermatology and Michigan Dermatology Physician Assistants. Outside of the office, Sherren enjoys spending time with her husband Matt, travelling, boating, skiing, and SCUBA diving. Sherren is an avid Detroit Lions fan and has held season tickets for many years. She also owns and loves to drive her classic American muscle car.